If you’re in the process of planning your survival pantry, you may find yourself wondering if brown sugar for your stockpile is safe? 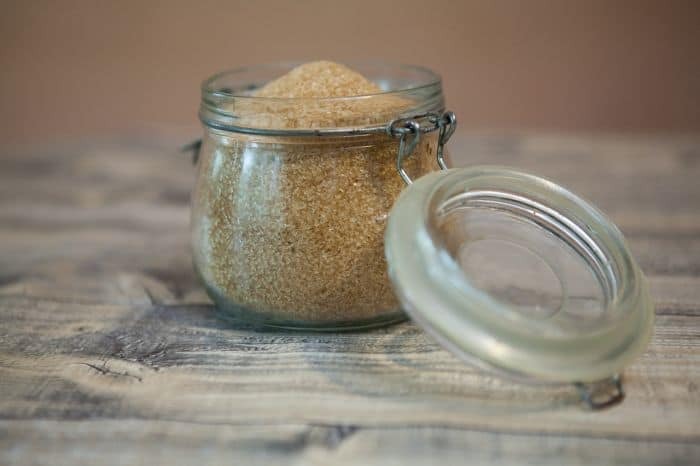 Although it’s common to store large quantities of dry goods such as flour, salt, rice, and sugar, there has been some controversy recently about whether or not it’s safe to include brown sugar for your stockpile. The concern with stockpiling brown sugar is that if not stored properly, it could become contaminated with a bacteria, Clostridium Botulinum, which when ingested cause botulism and cause serious illness, even death. Moist foods in low-oxygen environment encourage microbial growth and can result in botulism poisoning. Brown sugar is a moist food. Therefore, do not store brown sugar in reduced oxygen packaging like #10 cans or in pouches with oxygen absorbers. In fact, never use oxygen absorbers with brown sugar. It’s also important to know that vacuum packaging does not always prevent botulism in products that are moist, like brown sugar. It’s best to store moist food products in the refrigerator or freezer if storing long term. The risk of botulism is low in brown sugar that is stored properly. Why Should I Stockpile Brown Sugar for Survival? Although it’s not necessary for the human diet, brown sugar is helpful to have on hand for use in many different recipes. Brown sugar is glucose and is also considered a high carbohydrate food. This means your body can use it to turn into energy to fuel your body. If your body doesn’t get enough carbohydrates, protein, and fat coming in, it begins to pull from fat and protein stores in the body. In a prolonged survival situation, this means you could experience muscle weakness, fatigue, and other symptoms of ketosis. Brown sugar has a slightly higher mineral content than white sugar, thanks to its molasses content, and you can use brown sugar to sweeten cakes, coffee, pancakes, and biscuits. It can even be used to make marinades, stir fried vegetables, glazed vegetables, and some varieties of brown sugar are used to make rum. Brown sugar has also become popular as an ingredient in DIY body scrubs and can be used topically as an antibiotic in survival situations. One of the other reasons to stockpile brown sugar for survival purposes would be to use it in combination with other ingredients to pickle foods, such as eggs and cucumbers, for long term storage. When SHTF and refrigeration and freezers have no power, brown sugar could allow you to extend the shelf life of some foods. Sugars reduce the moisture available to anaerobic and aerobic bacteria. This creates a situation in which any bacteria that touch the sugar granules will burst because water leaves the bacteria through its membrane. This is why sugar can be used to preserve some foods and as a topically applied antibiotic. 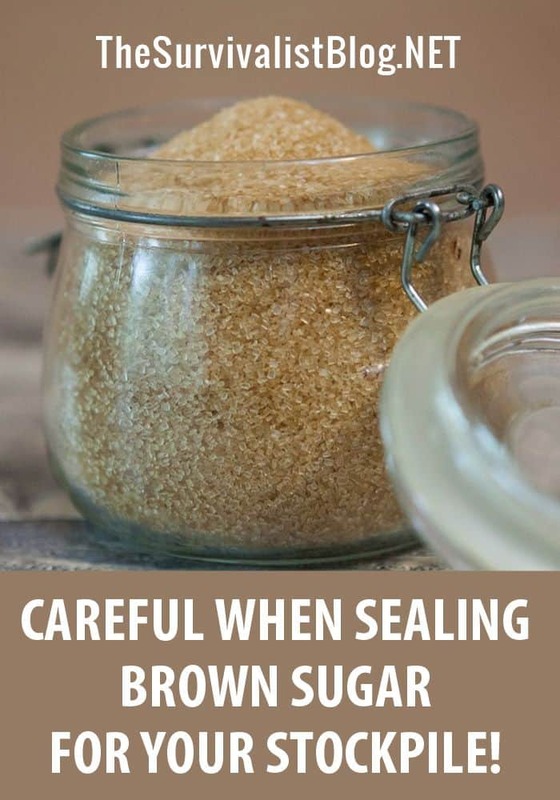 Keep reading for some ways to safely store brown sugar as well as several ways to safely soften brown sugar that has hardened during storage. In its original sealed packaging brown sugar can typically be stored until needed. Make sure you store in an area that is room temperature or cooler, free of moisture, and dark. 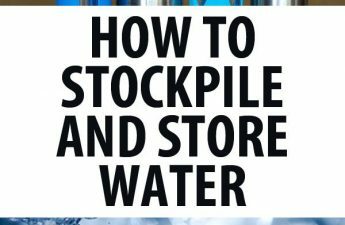 Many preppers put several packages of brown sugar in its original plastic packaging into a 5 gallon bucket and seal for extended storage. This works to help keep rodents away and provide additional protection from moisture. Brown sugar can also be dumped into a sealed airtight container, kept at room temperature and away from moisture and humidity. Brown sugar in a tupperware or rubbermaid container that is sealed and put into a cupboard, for example. Brown sugar can keep just fine up to 1 year this way. If it begins to harden, add a slice of bread and reseal the container or try one of the methods below to soften brown sugar. You can also store brown sugar in a container that won’t rust in the refrigerator. Keep container tightly closed. Shelf life of brown sugar is indefinite this way but use within 6 months for best flavor. A moisture proof plastic bag will also work when stored in refrigerator. For those who prefer a commercial option, you can purchase Brown Sugar in a can from MRE Depot which is nitrogen flushed and vacuum sealed. Follow manufacturer directions for storage and shelf life. Any time sugar is exposed to moisture or humidity it starts to clump and harden. Sugar, including brown sugar, is very absorbent. Brown sugar that has gotten hard is safe to eat, it just may be more difficult if you have to chip away at it. But there are many different techniques for keeping brown sugar soft during storage. We’ve listed several of them below. Lay a slice of bread on top of the brown sugar, inside an airtight container. The bread will absorb any moisture and become hard, but the brown sugar will stay soft. Replace the piece of bread every other month or so. It’s also safe to store brown sugar in a sealed container in the freezer to lengthen shelf life. It will need to thaw for several hours before use. Lay a damp, not wet, clay disc (porous) inside the airtight container along with the brown sugar. The disc can be left in with the sugar for several months. You can purchase brown sugar “teddy bears” designed to be soaked for 15 minutes in water and than stored in a sealed container with your brown sugar. The brown sugar stays soft because of the moisture from the teddy bear. Teddy bears only need to be soaked every six months. You can add a couple pieces of apple to the container of brown sugar and leave it sealed for a day or so. Be sure to take the apple pieces out once sugar softens. One more method to soften brown sugar is to store it in a ziplock bag beside a damp paper towel for a day or two. Brown sugar that has gotten hard during storage can be sprinkled with several drops of water, sealed in a plastic bag and then left to sit at room temperature for several days. But what happens if you are in the middle of baking your favorite recipe and you find that your brown sugar has hardened? You can’t wait several days for it to soften using one of the methods we suggested above. Below are several tricks to soften brown sugar quickly so you can use it without waiting. To soften brown sugar in a matter of several hours, put a clean, dried peel from an orange next to the brown sugar. The natural oils from the orange peel will help to soften the sugar. Another method to soften brown sugar quickly is to put hard brown sugar on cookie sheet or baking pan in the oven. Set the oven temperature at 250 degrees Fahrenheit. Bake brown sugar for 5 minutes or until it softens. For those times when you need an even quicker method, you can break hardened brown sugar into pieces and drop into your food processor. Blend or pulse/chop until sugar is softened. Another quick technique to soften brown sugar if it has begun to harden, is to microwave it, just 10 or 15 seconds at a time, be careful not to overheat the brown sugar. If you are still concerned about the potential risk of botulism when storing brown sugar, there is another alternative. Instead of storing brown sugar long term, you can make your own brown sugar as you need it. Stockpile sugar and molasses in your survival pantry and combine 1 cup white sugar to each tablespoon of molasses to make brown sugar when needed. Is brown sugar already a part of your stockpile? Share your favorite way to store it or your favorite way to use brown sugar in the comments below. 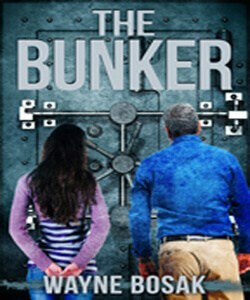 A mother of four and grandmother of six, Megan is living the lifestyle any prepper would want. Gardening, homesteading and constantly planning for emergencies big and small, she's a beacon of knowledge in the prepping community. For many of the reasons above, I only stock commercially canned brown sugar or white sugar and molasses. Now that I found a quality source for molasses in 1/2 gallon jugs, and with the price of commercially canned brown sugar, I stick with mixing my own. We also enjoy “pourable” brown sugar. It does not have the moisture content of regular brown sugar. For many of the reasons above, I only stock commercially canned brown sugar or white sugar and molasses. We generally purchase brown sugar in the 2 lb heavy duty zip top bag and keep it stored in the bag, getting it out from there as needed. 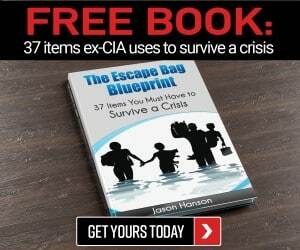 We use enough that it doesn’t usually have time to get hard; but, never seems to get hard in the bag in any case. We also have a lot of white sugar and molasses to make our own; but, only do that mixture on occasion to use up old molasses stock. We also keep a lot of white cane sugar, honey, and maple syrup on hand along with a lot of salt, since the combination of sugars and salt can be used for many things in cooking and both may be used for various kinds of preservation. Freezer, Yeppers, I store long-term in the freezer, probably 40 pounds or better. And yes if “Lights Out” than it will still store for a cpl of years after it thaws. I also have a few/several hundred pounds of good ol white sugar (mainly for canning and pickling), and many gallons of Mol. to make it if, ‘IF’ I happen to need it, but doubt if that will be high on the priority list after a cpl of years. This is overall a rather good article and I’ve discussed Clostridium Botulinum on this forum many times related to canning; but, hadn’t really mentioned brown sugar. Keep in mind that brown sugar being a moist food is not the only thing related to the potential growth of Clostridium Botulinum; but, also the alkaline (low acid environment) it creates. 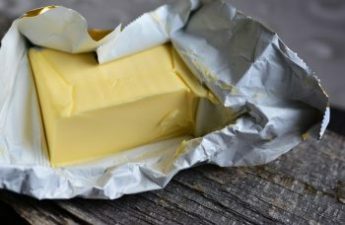 While brown sugar is slightly acidic, which is why it combines so well with baking soda for light baked goods, it is nowhere near the pH of 4.6 or lower required to stop Clostridium Botulinum growth and subsequent excretion of the toxin. In fact, never use oxygen absorbers with brown sugar. .
You should also never use O2 absorbers with white sugar either, since it will cause caking and clumping. It’s also important to know that vacuum packaging does not always prevent botulism in products that are moist, like brown sugar. It’s best to store moist food products in the refrigerator or freezer if storing long term. The risk of botulism is low in brown sugar that is stored properly. Actually vacuum packaging without high temperature sterilization or a high acid environment encourages Clostridium Botulinum growth, since it thrives in an anaerobic environment like that of a vacuum. We use it for many things; but, my favorite is a mixture of brown sugar and “real” butter, which produces a butterscotch flavored mixture that’s good in or on almost any desert. From Snickerdoodle cookies to pineapple upside down cake, this one ingredient makes the whole recipe. Actually brown sugar is Sucrose and molasses, not glucose, which is a disaccharide of glucose and fructose. This is a good one that could also include honey, salt, and smoke; but, sugar curing & aging of meats for long term storage is time honored and not that hard. Personally I think that smoked meats have a better flavor with some kind of sweetener added to the aging process. In its original sealed packaging brown sugar can typically be stored until needed. Make sure you store in an area that is room temperature or cooler, free of moisture, and dark. That’s how we keep it, in the original heavy plastic Zip Top bag, with extras stored either in 5-gallong buckets with Gamma Seal Lids or in one of the freezers. 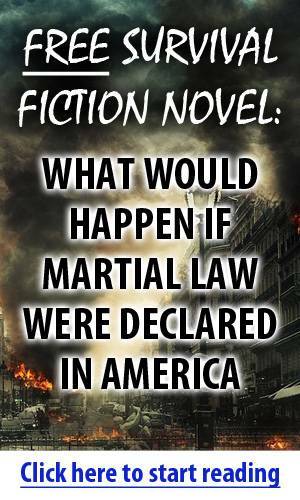 Many preppers put several packages of brown sugar in its original plastic packaging into a 5 gallon bucket and seal for extended storage. This works to help keep rodents away and provide additional protection from moisture. We store lots of things in 5-gallon buckets, including many non-food items. I think you hit all of the points here; but, one can also use a slightly damp paper or cloth towel in the sealed container with the brown sugar. We also do this; similar to the way we keep the separate components and make our own baking powder when needed. i don’t see see what the diference is really, brown sugar is not like cane sugar (original brown sugar, not processed or heavily refined and retaining the original minerals), brown sugar is just white sugar that had some molassas added to it. much easier to just use a little molassas in recipes if it affects the flavor as opposed to plain white sugar. i don’t vaccume pack, ido have some brown sugar (buy whats cheapest when i buy anything like it) the 2lb bags are just tossed in a bucket with a pop lid and thats just to keep mice from getting to it, i also keep white sugar in a bucket. also i keep a gallon jug of molassas, but far more i have mason jars full of maple syrup. i don’t keep more than a years worth on hand (i got a sweet tooth, i once wrote an article for bwh about making candy from burdock and maple syrup), i do keep buckets, suppiles and other supplies for sugaring, and before i had that i was making sugaring supplies (bits of hose for taps, and old soda bottles for collecting, and buckets for holding the collected sap and a water bath canner as an evporator pan). Learn something new everyday, I just bought some molasses, at Christmas time and haven’t opened it yet I will wait until I need it. Now I can make my own brown sugar thanks..